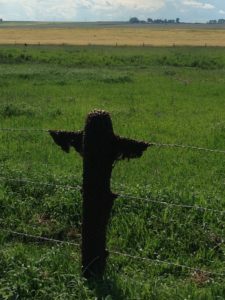 On of the most important aspects of spring management in a beehive is swarm suppression. 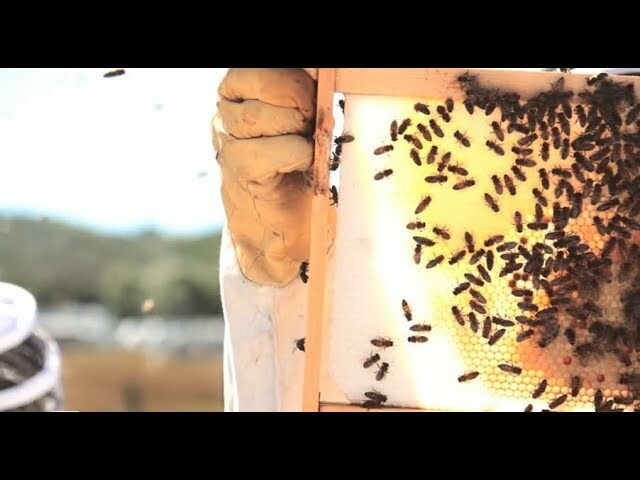 Swarming is an entirely natural act of perpetuating a colony’s population however, it creates an interruption in the building of the brood nest and the loss of worker bees can reduce overall honey harvest. It can also be seen as a nuisance, especially in urban areas, and can generate public concern and negative attention towards beekeeping. Swarms can occur if the bees force a weak queen to leave or, more commonly, if a colony begins to feel too cramped in its hive. In preparation for the swarm, the queen will lay eggs into large ‘queen cells’ and the workers will feed the larvae exclusively on royal jelly to produce new queens. When it is time to swarm, the queen and roughly half of the worker bees will leave to scout for a new hive location. Though it may look frightening, the bees are more docile in a swarm than at any other time. The remaining bees will become loyal to the strongest of the queens to hatch from her cell. 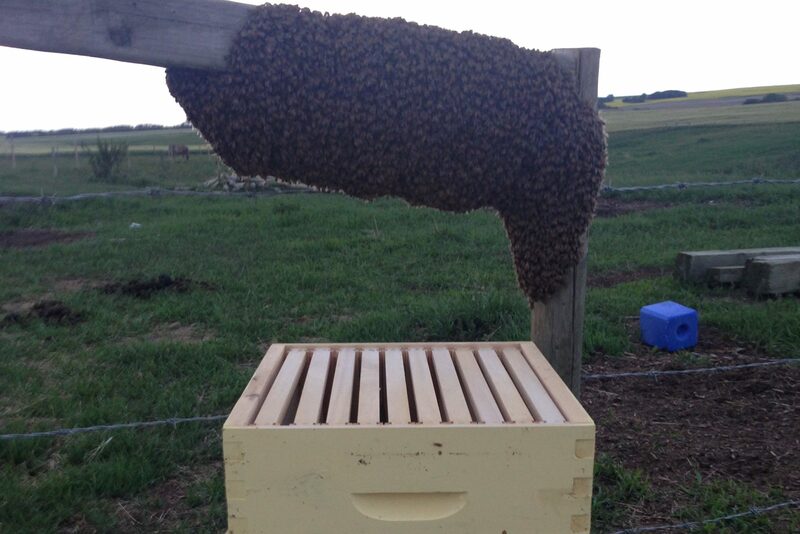 Swarms often occur after a bout of poor, rainy weather, when the bees have been cooped up in the hive with high humidity and reduced airflow. To help prevent swarm activity it is crucial to provide both sufficient space and ventilation. The queen must have enough space to expand the brood nest and the workers must have adequate storage for the nectar flow. Space can be created in the hive by checker-boarding the brood nest; alternating full frames with frames of empty comb. 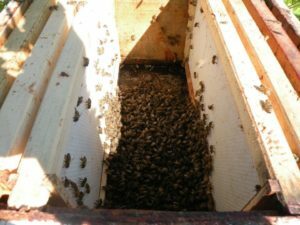 Beekeepers can also add extra brood or honey supers. If you don’t have extra comb? It is IMPERETIVE that you checkerboard with empty frames or bars (TBH) throughout the whole hive DURING the dandelion flow and consolidate the brood in the bottom boxes and honey in the top boxes. Your brood (if a queen excluder hasn’t been used) will be mostly in the top box. This is because the the top box is the warmest place. You will need to change this around or the colony will become honey-bound when the queen wants to move down and can’t because of honey stores. The difference between Queen Cups and Queen Cells? Queen cups are formations of wax that are placed by the bees in the brood nest throughout the season. I like to think that if I find more than 4 queen cups, that my bees may be thinking about preparing for an eventual swarm. This means I have time to act on making space (how to is stated above). Queen cells are a different story. If your hive is full of queen cells, cells that have royal jelly and larva in them, you have missed your chance and it is time to make a Forced Swarm Split or catch them (much harder to schedule nature). 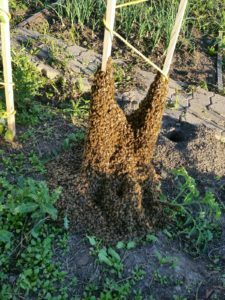 Keep in mind that swarm mitigation steps are far more effective if action is taken before there is a problem. Early, careful monitoring of hives is important during spring build-up in order to ensure that a hive can expand as needed. If you are on the ball, swarm risks can be greatly reduced and overall productivity of the hive can be improved. If you are not a beekeeper and you spot a swarm, there are usually local beekeeping organizations that will remove the swarm.